Pancreatic islet - metaplasia, hepatocyte. A band of metaplastic hepatocytes has encircled this islet in a female F344/N rat from a subchronic study. Pancreatic islet - metaplasia, hepatocyte. 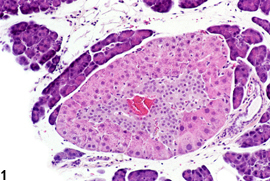 Metaplasia consisting of hepatocytes within an islet is present in a male B6C3F1 mouse from a chronic study. 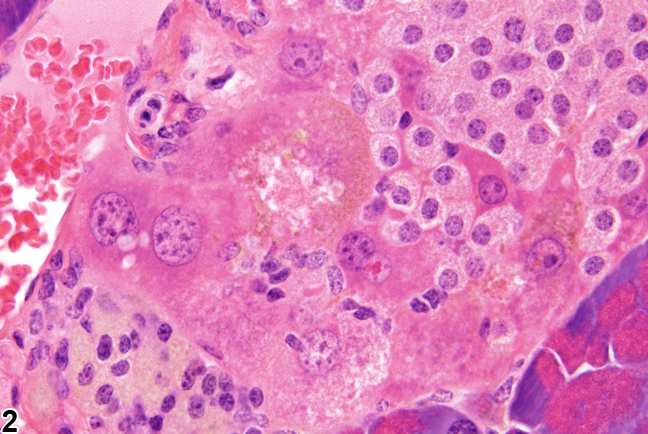 Hepatocyte metaplasia of pancreatic islet cells is characterized by the presence of hepatocytes in an occasional islet, usually at the islet periphery. While it may be an incidental finding in rats, hepatocyte metaplasia can be induced by peroxisome proliferators, by methyl-deficient diets, and experimentally by copper administration/withdrawal. 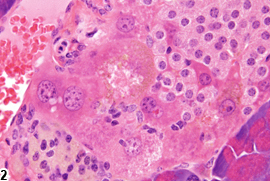 Metaplastic hepatocytes can occur within 15 weeks following induction by xenobiotics. Because this change has been associated with exposure to xenobiotics, it should be diagnosed whenever present and graded. Grading should be based on number of islets affected and number of hepatocytes present.